Jessica joined our Finance Department in 2016. 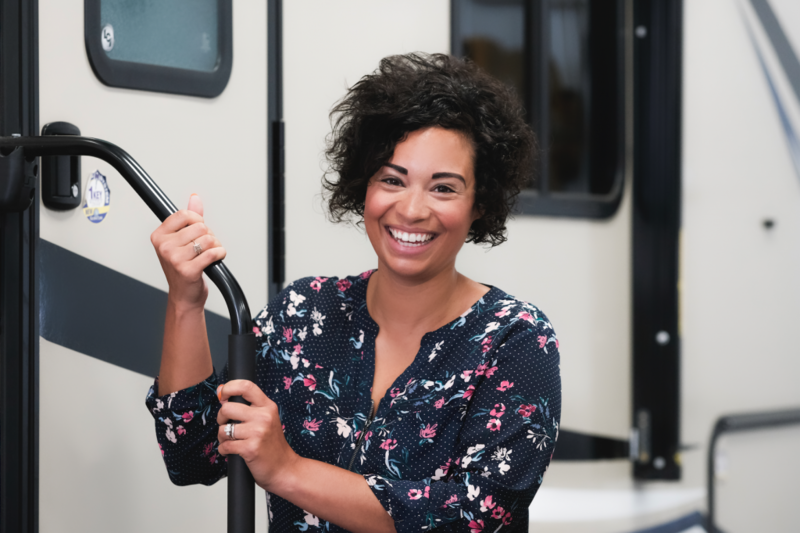 She loves meeting customers and helping them buy their dream camper. In her free time, Jessica enjoys spending time outdoors and with her husband and their dog Rusty and their friends and family. It is pet-friendly, family-oriented, and all-around fun. It’s a time to gather, relax, and enjoy the company of each other in the great outdoors. All of the meals are my favorite. Camping is about being together and eating all the time. Tacos are always easy and yummy. I love going to Tawas State Park where there is a nice beach and a good trail for walking and biking. It’s close to home, but far enough away to feel like Up North. Fun downtown, too. In Michigan, there are so many things to do for all ages all year. In the U.S.A., there is so much to see. Each state is unique in its own way and there are so many different cultures. I love our freedom. I am grateful for my husband, my dog Rusty, and my family and friends. I am grateful for the time that I am to spend with my loved ones. I pledge to always help with whatever I can to make their experience here at Tri City RV one to remember and to keep them coming back.